You are here: Home / Africa / Namibia / Merry Christmas! While Christmas Eve in the United States typically is a mad rush until 6pm or later for last minute shoppers to find gifts for loved ones and families, holiday party planners making mad runs to the supermarket for food, booze and assorted goodies and everyone else jockeing through traffic to get home to be with family, here in Swakopmund I experienced the most bustle of activity in 3 days. Through the main intersection in town flowed a steady stream of cars and trucks, many of them hauling huge trailers with quad bikes, or heavily kitted 4x4s with extra fuel strapped to the roofs and the ambitious anglers with large poles sticking out of holders attached to the front bumper and grill of cars and trucks. Some of these ironically positioned at angles and when I see coming down the street it looks like a massive eland or oryx antelope barreling down the road. But then like magic at 2pm the streets fell silent. The bottle shops closed up tight even earlier. What it is, a wild antelope or a 4×4 cruising down the salt road? Earlier in the week it was time for me to test how liberal the corkage policy might be at a restaurant. So with a bottle of 2005 La Motte Shiraz in hand I wandered the streets, peering into windows of restaurants despite the ever present hi-vis vested security / parking guards lingering in front. I made two loops and finally settled on the location for a holiday dinner. The menu looked good but I was sold by the stemware that I saw gracing nice table settings. I figured if the chef/owner invested in real wine glasses with sheer rims, nicely shaped and voluminous bowls, the food would have the same attention to detail. 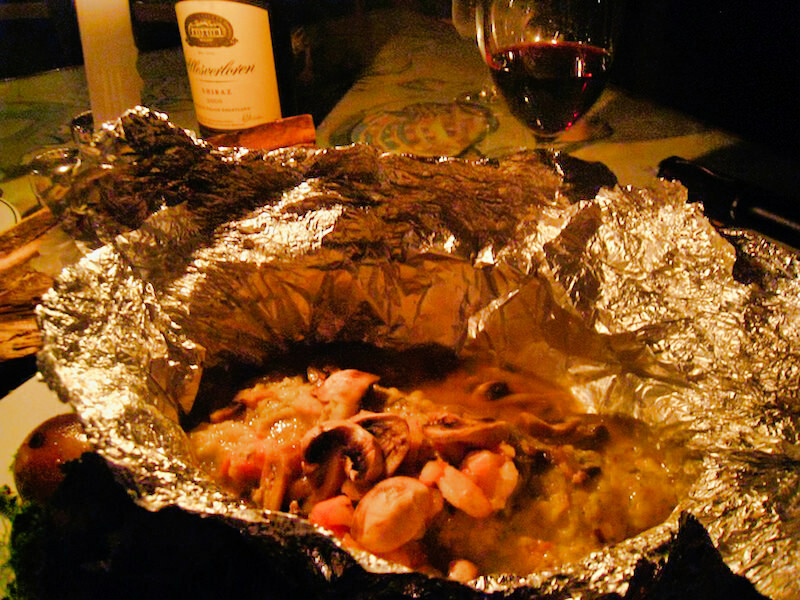 I opted for the safari platter giving me yet another sampling of wild game. With so many days spent in Swakopmund I’m toying with the idea of a separate blog post with capsule reviews and photos of some of the meals I sampled this holiday season. For Christmas eve I dragged a bottle of 2006 Allesverloren Shiraz from Swartland (where I believe the best Shiraz’s in South Africa come from) into what many told me was the best seafood restaurant in town. 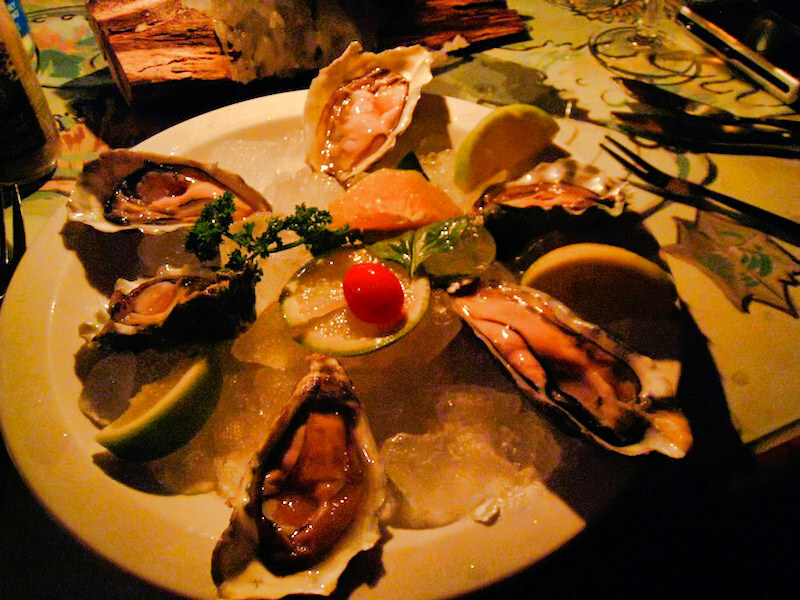 in an old Tugboat that has been built upon and converted into a restaurant on the beach I enjoyed fresh Walvis Bay oysters and a Kingclip fish cooked Namibian style, wrapped in foil and baked with mushrooms, peppers and onions – a perfect choice while dining on the Atlantic Ocean. Christmas Eve dinner at Tug in Swakopmund, Namibia. Ah. But what to do for Christmas? I have to admit, though the streets are festively decorated, my hotel has a Christmas tree, store windows exude the holiday spirit, it doesn’t feel like Christmas. As a lone traveler I will miss the the smiles of my nieces as the open the gifts sent to them, including colorful ostrich boas from South Africa. I’ll miss wandering through the wine cellar with my brother trying to decide on which wines will accompany a tasty holiday dinner. And then there’s my mom’s incredibly famous coffee cake, which she almost always sends me express to my home in California. Yes. It’s just not the same. But I figure why not find an extended family to hang out with. Watch the children play, listen to the elders and experience togetherness that makes Christmas. I know it can’t be too hard, nor too far to find this. I was pleasantly surprised to find the scenic ride across the salt flats to be on a hard packed surface with achievable speeds of 120kph or more . Cão not only was the first European to set foot here, he was the first to travel this far south. 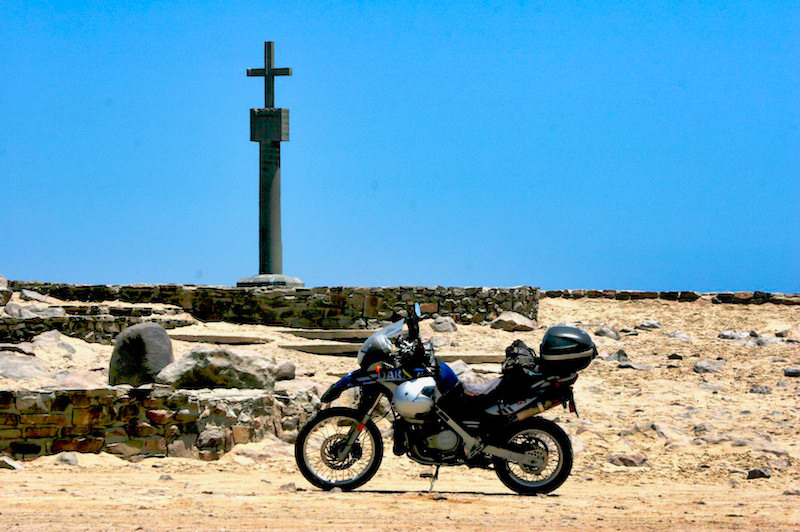 That stone cross stood proud and erect until discovered in 1884 by the Germans who were looking for a better port than Swakopmund for their newly formed African colony. With four-hundred years of standing on the windswept headland, the cross had broken in two pieces. The German’s dragged the cross back to Germany where it sits today in a museum. A year later it was replaced temporarily by a wooden cross and then a replica — except this time the inscription included those words in German. 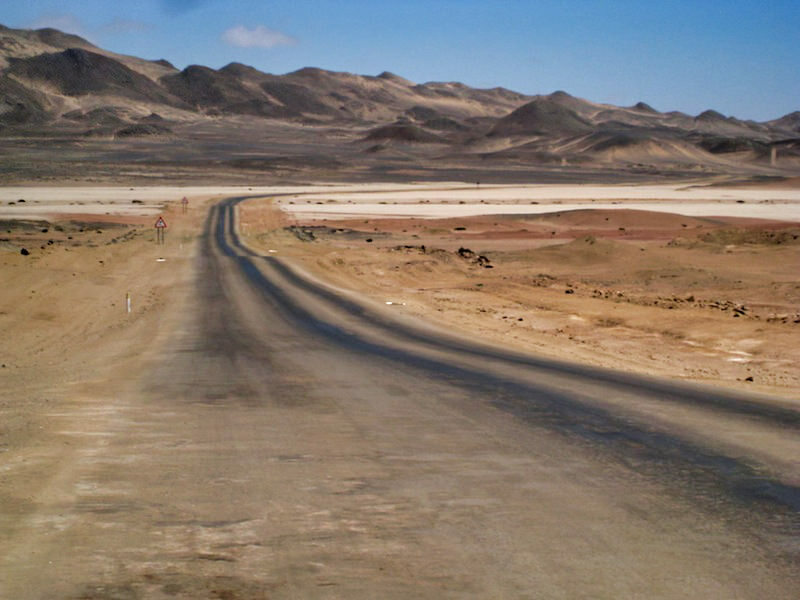 Set nearly 100 miles from Swakopland across miles of salt plains, Cape Cross as it was named wasn’t suitable for a port, it did become and important trading post due to the massive seal colony that resided there. This amazing mass of Cape Fur Seals, a species of sea lion, was probably what drew Diego Cão to the coast here. 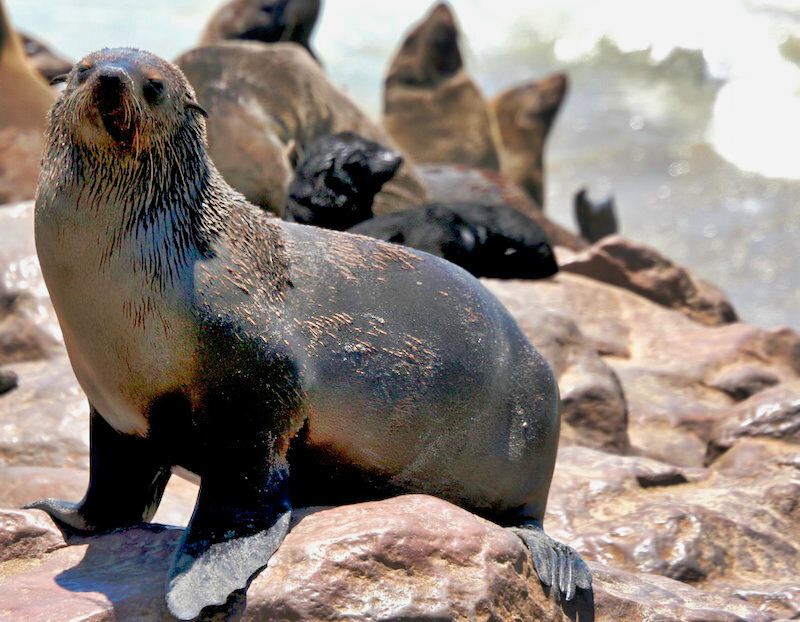 Today Cape Cross is the largest breeding place for these Cape Fur Seals, of which there are 24 such colonies along the Namibian and South African Coast. But here it is estimated that 80,000 – 100,000 seals, mostly cows except during October and November when bulls come to claim their territory and breed with their cows. So this unlikely, and frankly somewhat smelly family were happy to have me as a guest on this Christmas Day in 2007. Hundreds of seals were surfing the waves, while still more youngsters waddled on the sand and rocks while the cows, their mothers, honked and snorted and with feisty aggression tended to the youngest of these delicate creatures. I was lucky to be here in December for it’s this time that most of the youngsters are born. Sadly there is a mortality rate of more than 25% and evidence of this was strewn about the colony and even a few on the fringes of the parking lot. But this, I guess is natural selection at work, for they are hunted by hyenas and jackals as well as premature birth, starvation and drowning cause so many to die. 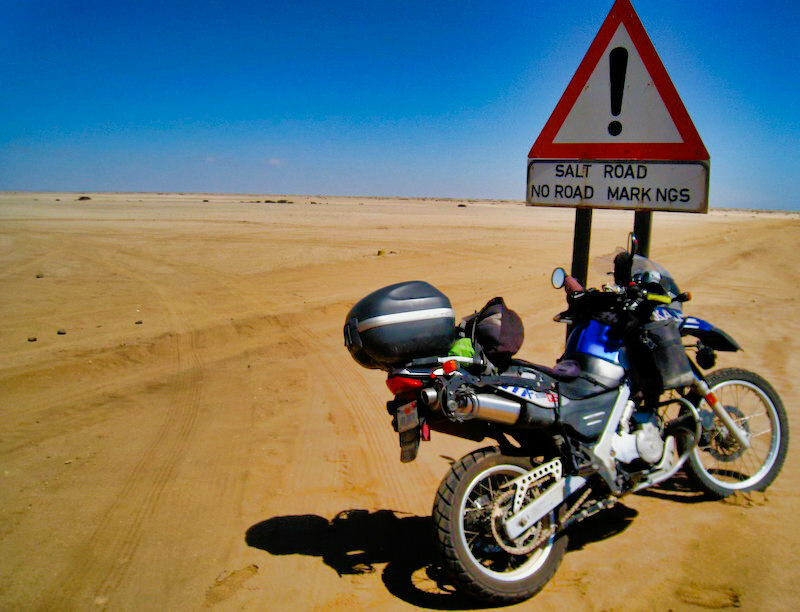 I expected the 200 mile journey to be across the typical gravel, dirt and sandy roads I’ve come to both love and hate in Namibia. But i was surprised to find the surface of this “salt road” to be solid, smooth and suitable for highway like speeds. Making the turn toward Cape Cross I hobbled along 10km of a somewhat rutted, bumpy and rocky stretch until coming to a tiny outpost where a permit must be purchased before continuing on the 5km further to the look out point for the Seal Colony and the replica cross. The two women in the tiny cube of an office with tattered and faded papers describing the history of Cape Cross and the seal colony were jabbering on in what must be the most expressive conversation in one of Africa’s amazing yet difficult to understand and learn “clicking” language. Somewhat musical but as the passion of their discourse elevated the clicking became louder and more punctuated. I wondered if this was a show for me. The desolate outpost settlement included three buildings. 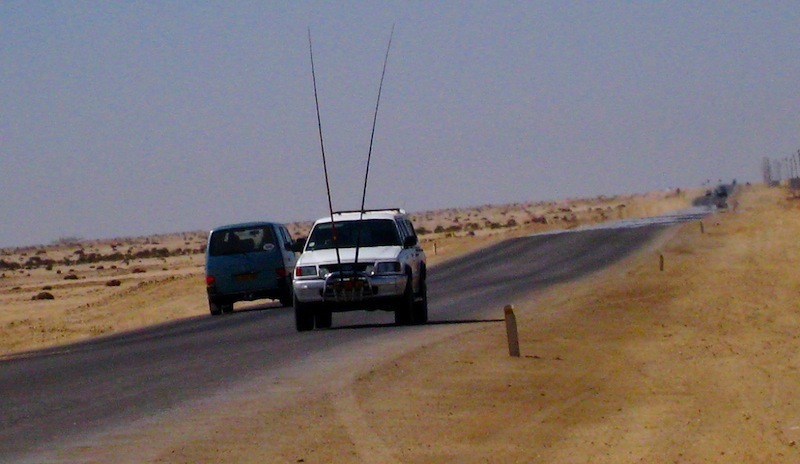 Tall antennas stretched to the sky. I looked around but saw no telephone, television or radio. The women weren’t dressed in uniform but the women behind the counter thrust an old ledger book in front of me and asked me to sign it. “Wait, ” she abruptly clicked, “you want to go in there on a bike?” I eagerly nodded as I started scribbling in her book. “You can’t go in their on a bike!” I looked at her with as much disappointment I could conjure up on my face. I looked straight at her and asked why. She looked at me with a look that could only be described as a “yeah, right”, as she thrust the book in front of her next victim. “Is that a promise you’re making?” she asked as a smile came to her face. “You sure?” She scribbled out on a piece of paper a few words, asked for my plate number and N$50. “I’ll be watching and listening for you mister,” she said while handing me receipt number P5441xxx from the Ministry of Finance of the Republic of Namibia and explaining that the entrance fee I just paid was for one CAR, as motorcycles are not permitted entrance to the Cape Cross Seal Reserve. 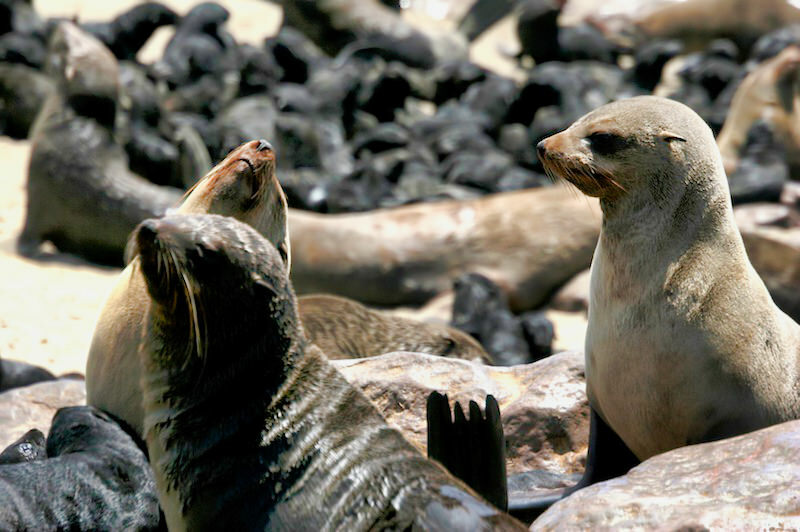 There are an estimated 80,000 to 100,000 Cape Fur Seals that use Cape Cross as a breeding ground here in Namibia. The original cross was erected by Diego Cão and his crew in 1485. 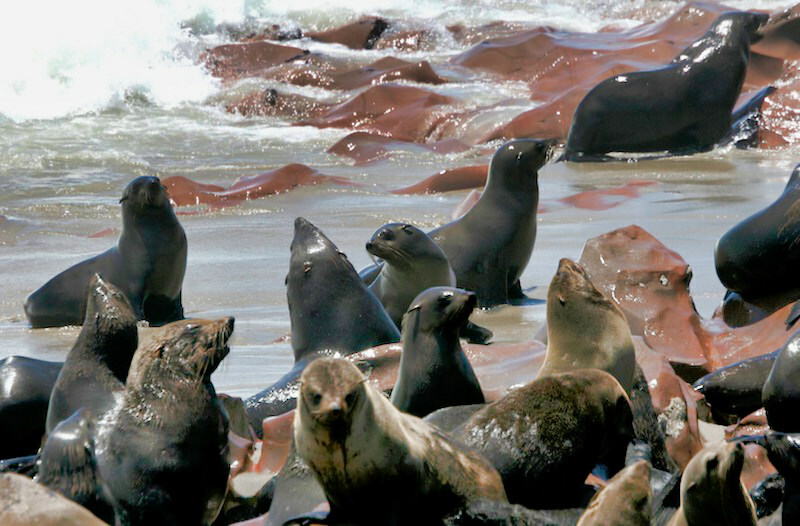 They’re noisy, smelly and plentiful – a species of sea lion – The Cape Fur Seals. Hey! Whatcha lookin’ at buddy? I practically idled Doc the last 5km to Cape Cross and the thousands of seals celebrating Christmas there this day. On my way out I stopped and talked to my new friend, looking for a little acknowledgment on how quiet I rode through the reserve. “Did you hear me?” I asked meekly. “You were way too loud, ” she says in a serious tone. I’m a bit hurt by this cause I barely putted my way through. “Jokin’. Jokin'”, she smiled and patted me on my helmet before disappearing into her office. https://i0.wp.com/www.worldrider.com/wp-content/uploads/2014/08/eland_or_truck-tm1.jpg?fit=600%2C348 348 600 allan https://www.worldrider.com/wp-content/uploads/2014/08/worldrider_logo_white_border-trans1.png allan2007-12-25 19:01:362007-12-25 19:01:36Merry Christmas! The last few weeks in pictures have been stunning. Even my kids are impressed. It seems that the adventure is going well. You truly are a magnate!! Keep on trucking I’ll be keeping on eye on you. Bueno suerte!! I hope you found that family on Xmas that you wrote about… It would be a pity if you didn’t…. I’m sure your nieces would have loved to have had you there with them for the holidays…. Good luck in the new year!